A lightweight bike lock. That’s what we all want isn’t it? A lightweight lock that’s easy to carry around and that keeps our bike safe. It’s not too much to ask, is it? Lightweight, yes. But this lock will NOT protect your bike! Well, there are loads of lightweight bike locks. The shops are full of brightly colored cable locks and spindly armed U-locks. And they’re usually really cheap too. But the problem is: none of them will protect your bike! Why? Well, unfortunately there’s a direct link between weight and security. And generally, the lighter a bike lock, the less secure it is. But hold on, hold on! 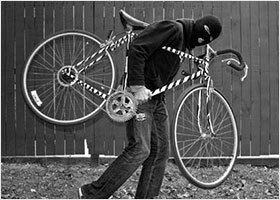 Before you run off, there are lightweight bike locks that will protect your bike. They’re just not the feather-light tat you’ll find in the shops. So keep reading and I’ll introduce you to four bike locks that don’t weigh a ton and will actually keep your bike safe. But before we start, a quick clarification. As far as I’m concerned, you should always choose a lock that’s rated at least Sold Secure Silver (or equivalent). I don’t recommend locks that are less secure than this as they just don’t provide enough protection. So all the lightweight bike locks here offer at least Sold Secure Silver levels of protection. If you’re not sure who Sold Secure are or how to decide what level of protection you need, check out my complete guide to choosing the best bike lock. While most bike locks are made from steel, the TiGr mini is mostly titanium. And since titanium has unparalleled strength to weight ratios, this is the lightest, mid security lock available today (by some distance). Weighing just 0.9 lb (0.4 kg), the TiGr mini isn’t much heaver than 1 can of Coke! And it’s a whole 50% lighter than the Kryptonite Evolution LITE Mini-6 which is the lightest U-lock offering the same level of protection. So just how safe is it? Sold Secure haven’t tested it yet. But ART the Dutch security organisation have tested it and awarded it 2/5 stars. This is roughly equivalent to a Silver rating from Sold Secure and makes the TiGr a mid-security bike lock. So it’s not a lock for valuable bikes in high risk areas. And it’s not a lock to protect your bike overnight. But it’s fine for lower risk areas and it would make a great secondary lock in more risky circumstances. And it’s not just light. A solid frame mount makes it easy to carry around on a daily basis. It looks great. And you’ll get fantastic after sales support from a US company that really cares about it’s product and it’s customers. It’s a very small lock so you’ll need to make sure it’s suitable for your bike and the places you want to secure it. And it’s also pretty expensive. But if you’re looking for the lightest bike lock currently available that offers a decent level of protection, you should definitely check it out. Read my in-depth review of the TiGr mini here. Like the TiGr lock, the LITELOK shuns steel. In this case for a completely new, super light, super tough material they call “Boaflexicore”. This innovative material allows the Litelok to be the same length as a cable or chain lock, weigh less than a high security mini U-lock and still offer Sold Secure Gold levels of protection! The Litelok is 29″ (74 cm) long, making it the same length as a chain like the Hiplok. And that’s not super long. But it’s long enough to give you loads more locking options that you get with a U-lock. If we compare it to other Sold Secure Gold bike locks, the lightest I can find is the OnGuard Pitbull Mini, which at 2.54 lb (1.15 kg), actually weighs a little bit more than the Litelok. And remember that it’s a mini U-lock so you’re locking options are even more limited. So what’s the drawback? Well, it’s quite expensive. It’s quite bulky. And it’s not as flexible as a cable or chain. This means getting it around your bike can be frustrating and carrying it about is more challenging that you’d imagine. However, this is an incredibly light, high security bike lock. And if weight is your primary concern this is definitely a lock worth looking at. Read my full, hands-on review of the LITELOK. LITELOK also have a new Sold Secure Silver rated lock. It’s made from the same “Boaflexicore” material but there’s less of it, so it’s obviously lighter (and less secure) than the Gold version. 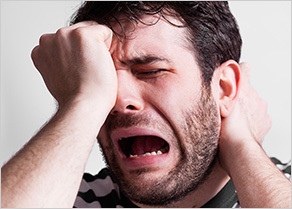 But they’ve also made some improvements in the usability. A vertical locking motion makes it easier to close and a naturally circular shape makes it easier to get around whatever you’re locking your bike to. It’s also really easy to carry around your waist like a belt. It’s not quite as light as the TiGr but it has much bigger internal dimensions, giving you far more locking options. So if you don’t need a super secure lock and you’d like easy portability and lots of locking options, this could be a good choice. Read my full review or the LITELOK Silver. Both these locks offer completely new forms of bike security. And that’s great. It’s these sorts of innovations that drive things forward. But they’re still something of an unknown quantity. They haven’t been fully battle tested by thousands of cyclists using them every day! And how suitable they are for you may not be clear. As I mention above, the Kryptonite Evolution LITE Mini-6 is the lightest Sold Secure Silver U-lock currently available. And apart from the TiGr mini, this makes it the lightest mid-security bike lock full stop. It’s clearly a mini U-lock, measuring just 2.75 x 6″ (7 x 15.3 cm). And while that doesn’t make it particularly short for a mini U-lock, it does make it very narrow. In fact it’s one of the narrowest U-locks on the market. So make sure it’s suitable for your bike and the places you’ll be locking your bike before you buy it. Because you’re pretty much limited to bike stands with this one. The shackle is only 11 mm thick, but it’s made from a “MAX-Performance” steel that’s as strong as Kryptonite’s other 13 mm shackles. And this is reflected in the security ratings, with Sold Secure giving it a Silver award. In fact it’s the only 11 mm U-lock with a Sold Secure Silver award. But it’s not double-bolted. And this is not a primary lock for high risk areas. But just like the TiGr, it’s a great lightweight lock for less valuable bikes, less dangerous areas and shorter stops. And like the titanium lock, it would also work well as a secondary lock. So if you’re looking for a super light bike lock at a very reasonable price, you should definitely consider the Kryptonite Evolution LITE Mini-6. While both the Abus U-mini 401 Yellow and the OnGuard Pitbull Mini may be slightly lighter, I’m going to recommend the Abus Granit X-Plus 54 Mini here. Why? Well, I think the Abus 401 Yellow has been discontinued and is increasingly difficult to find. (On top of that, I’m not convinced that it’s given weight of 2.34 lb (1.06 kg) is in any way accurate). And the OnGuard Pitbull Mini isn’t as secure and is really only 1 gram lighter. Whereas the Abus Granit X-Plus 54 Mini is a very special lock. Pretty light and incredibly secure, I can’t understand why it’s so often overlooked. 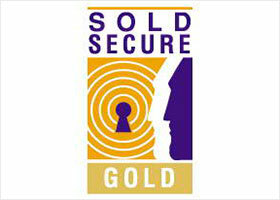 Not only is the 54 Mini rated Sold Secure Gold. It’s also Sold Secure Motorcycle Gold. And it has 3/4 stars from ART. All this means that it’s a very, very secure lock. And because of it’s special parabolic 13 mm shackle, it still only weighs 2.56 lb (1.16 kg). Which is incredibly light for lock as secure as this. Obviously it’s a mini U-lock, so it’s pretty small. But measuring 4.23 x 5.51″ (10.8 x 14 cm), it’s actually pretty wide for a smaller U-lock so your locking options won’t be too limited. Again, it’s not cheap by any means, but a relatively light, high security lock never will be. So if you’re looking for a more traditional lock with an unbeatable security to weight ratio, the Abus Granit X-Plus 54 Mini could well be the best bike lock for you. So these are the 4 lightest bike locks available today. Locks that will actually protect your bike. Apart from the TiGr and the Litelok, the best options if weight is your biggest concern are U-locks. Chain locks are always heavier. And there are no cable locks here because they’re rubbish and won’t keep your bike safe! When you’re choosing a lock, think carefully. 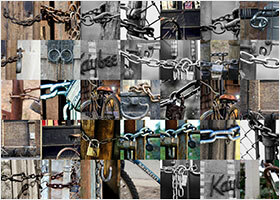 All bike locks offer a balance of three qualities: price, practicality and security. You need to find a balance where your lock is affordable and easy to use and (most importantly), secure enough to prevent your bike from being stolen. If you want a particularly lightweight bike lock then you’ll need to make sacrifices elsewhere. Maybe it will be smaller. Maybe it will be more difficult to use. Maybe it will be more expensive. Maybe it will be slightly less secure. Just remember that security is the most important job of any lock. Make sure you’re aware of the security level you need for your circumstances and choose accordingly. And never go less than Sold Secure Silver! Need more help understanding what level of security you need? Check my extensive 3 step guide to finding the best bike lock for you. Ahh OK, thanks Jon. I’m very dubious about the Altor lock! Please test the Ottolock. It looks like a good lock and is under 1 lb. Let us know what you think! Thanks. Yes I’d really like to review the Ottolock! From what I’ve read it will make a great cafe stop lock for racers etc. But I don’t think it will be strong enough to use on a day to day basis, as anything other than a secondary lock. How does ottolock compare to the Tigr mini? But I haven’t looked into them in too much detail yet. I will though! Just noticed a review on the Ottolock website. For UK (and presumably, EU) customers there’s a 65% markup to clear customs. That’s not worth it to me. Shame. I’ll wait until there’s an EU distributor. 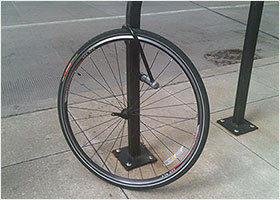 Will you try the texlock bike lock ? The Texlock looks really interesting. But they haven’t had it evaluated by any third party testers so it’s difficult to know how secure it really is. If they get it tested, I’ll review it. However, even without such an evaluation, I’d say it’s much tougher than a cable lock and may be suitable as a secondary lock for wheels and seats. I definitely wouldn’t use it as my primary lock at the moment though! I’ve been using Master Lock’s Streetcuffs for 10 years and no one has tried to tamper with them. They have to be used correctly though, I lock 1 shackle round the bike stand and the other around the rear wheel but within the rear triangle. If they cut the one round the stand or the link they still have to deal with the one on the wheel! They weigh about 2.5kg so not super light, but they fold in two and you don’t need the key to lock them. I carry them in a deuter frame bag. I’m thinking of getting a second one for high risk areas, I’d use this one for the front wheel meaning the thief would have to make 2 cuts minimum to ride away, but then 1 shackle would still be on the frame requiring an extra cut before the bike can be sold! So, for me it’s not just about how strong the lock is but making life very difficult for the thief. I think for me, at Sold Secure Bronze, the Streetcuffs are just not secure enough. Presumably the low rating is because the links between them can be easily cut? However, as you point out, if (after having cut through the links) they’re still not able to ride the bike away (because of the cuff around the wheel), they’re much less likely to bother. It’s all about finding a system that works for you I suppose! 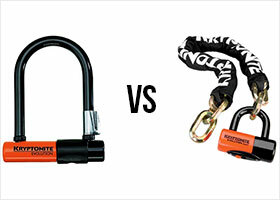 How does the Abus Granit Futura 64 compare to the Kryptonite Evolution Mini-6? It’s just 726 g with an 11 mm shackle. So the specs are very similar to the Kryptonite. They both seem to be a perfect compromise between weight and security. I’d just like to know if one of them is stronger or harder to pick. Well, I’d say the Abus is probably more secure as it’s double bolted, while the Kryptonite is only locked on one side. That means the Kryptonite is more susceptible to leverage attacks. I’m not sure which would be easier to pick but I wouldn’t worry about that too much … they’ll be both difficult enough to pick to stop it happening in the street.